C. difficile infections represent a significant problem for the healthcare industry. C. difficile spores allow the transmission between hosts because the dormant spore is naturally resistant to many environmental insults (e.g. chemicals or antibiotics). The focus of our lab is to understand the underlying biology of this human pathogen with the end-goal of designing novel treatment options. germination is initiated upon bile acid exposure. Bile acids are small, cholesterol-based molecules that are synthesized in the liver and stored in the gall bladder. Upon secretion into the digestive tract, bile acids help absorb fat and cholesterol and are actively reabsorbed and recycled to the liver for use in another round of digestion. Bile acids also have antimicrobial properties. Thus, because C. difficile spores recognize bile acids as germinants, they must have mechanisms to resist the toxic properties of bile acids. 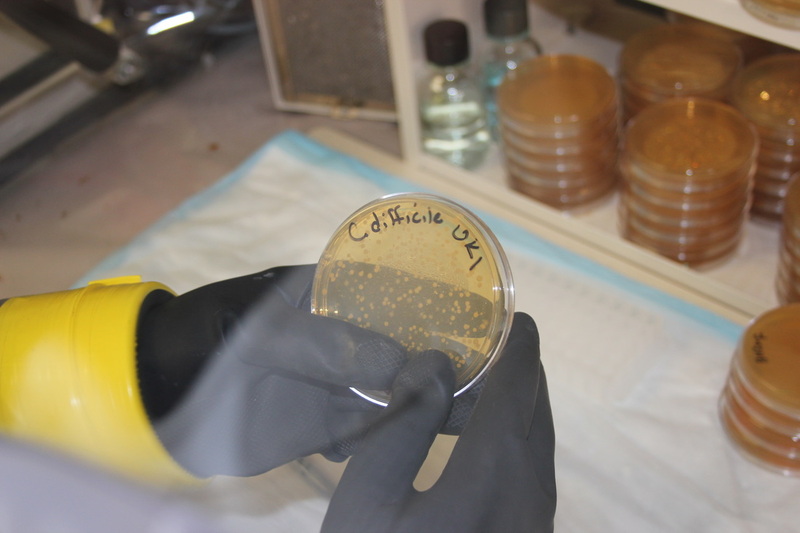 Our lab is focused on understanding the molecular mechanisms of C. difficile spore germination and bile acid resistance and to use that knowledge to develop new, targeted therapies to combat C. difficile infections. Certain bile acids (cholic acid derivatives) stimulate C. difficile spore germination, while others (chenodeoxycholic acid) are competitive inhibitors of C. difficile spore germination. While the signals that stimulate C. difficile spores to germinate are known, with what they are interacting on the C. difficile spore was not. Based on homology searches of known germinant receptors from Bacillus spp. and Clostridium spp., the C. difficile genome does not encode the classical ger-type germinant receptor. Using a genetic screen to identify mutants whose spores are unable to germinate in the presence of taurocholic acid (a known germinant), we discovered that the protease-like CspC is the bile acid germinant receptor. We are currently characterizing this receptor and its role in transmitting the bile acid germination signal to begin the process of germination.